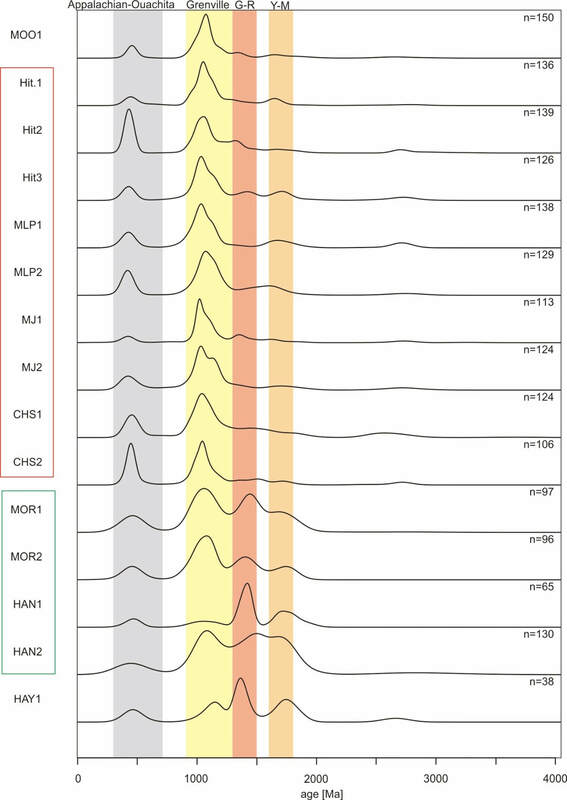 Late Mississippian to Early Pennsylvanian time saw major changes in tectonics, climate, and eustacy globally. Transcontinental sediment transport from the Appalachians to Great Canyon across North America has been proposed to initiate at this time. In the midcontinent, clastic influx to the Hugoton Embayment and Arkoma Shelf may record evidence for this model, but the limited number of studies on the provenance of sandstones has hindered interpretations. 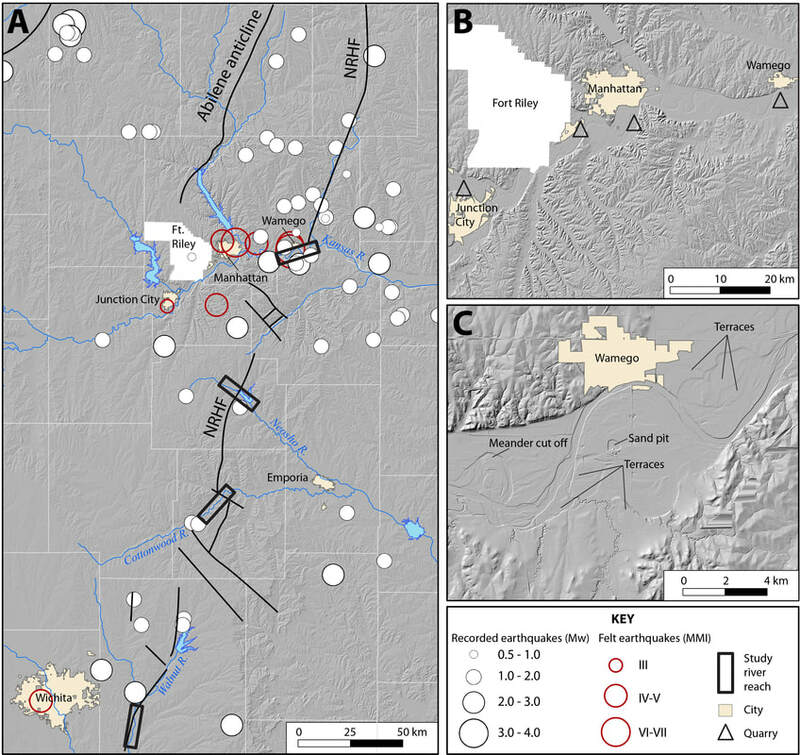 The role of the ancestral Rockies and Ouachita-Marathon orogeny in sediment dispersal is also unknown. 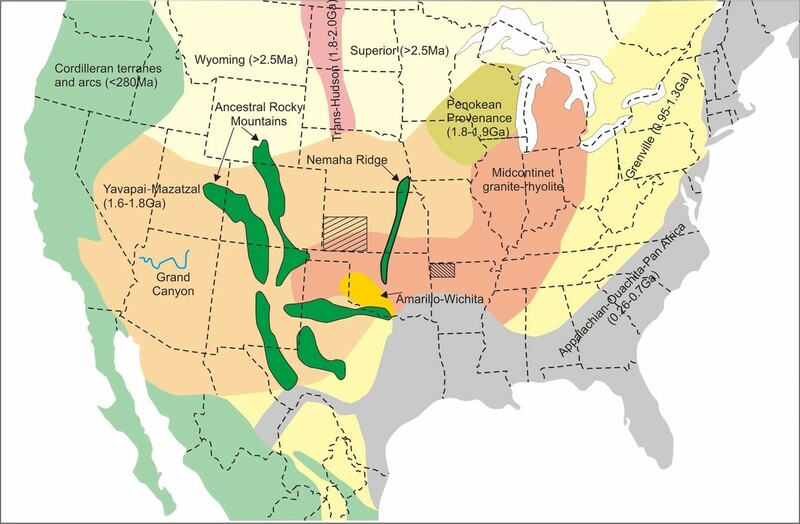 This research tests the transcontinental sediment transport model and further constrains source-to-sink systems in the midcontinent through evaluation of the provenance of upper Mississippian to middle Pennsylvanian siliciclastic intervals, in southwestern Kansas and northwestern Arkansas, using sandstone component analysis and detrital zircon U-Pb-He double dating. Collaborators: Andreas Moller (KU) and Daniel Stockli (UT). Figure 1. (above) North American crustal provinces, adapted from Gehrels et al. (2011), Xie et al. (2016), and Xu et al. (2017). Rectangles with diagonal fill are the southwest Kansas and northwest Arkansas study areas. Figure 2. (right) Kernel Density Estimation (KDE; Vermeesch, 2012, 2016) of the samples from Chester (red) and Morrow (green) and two samples from Kinsler Field to the west (HAY1) and the Lexington Field to the east (MOO1). Figure 3. (A) Study area showing locations of select study river reaches, the NRHF, and recorded and felt earthquakes. (B) Locations of quarry sites along the Kansas River. (C) Example of high-resolution LiDAR imagery showing detail of select geomorphic features along the Kansas River near Wamego. Kansas and Oklahoma have experienced unprecedented seismicity linked with the large-scale injection of wastewater. A major challenge to evaluating seismicity is that subsurface faults and stresses are not well known, making it difficult to locate sites for new disposal wells or make decisions regarding operations of existing wells. My research focuses on utilizing a wide variety of dataset to map subsurface faults and lineaments and in situ stresses, with the aim of identifying structures and regions that may be at higher risk for injection-induced seismicity (e.g., Schwab et al., 2017). Several projects focus on spatial analysis and modeling of injection data (volumes and pressures) and reservoir-geomechanical simulations of brine disposal to better resolve magnitudes and spatial extents of pore pressure changes within the injection reservoir and their relationship with the observed seismicity. I work closely with colleagues at KU (George Tsoflias) and Kansas State University (Brice LaCrois) on new seismological methods and approaches to mapping pore pressure changes in the crystalline basement. My injection-induced seismicity research is supported by funding from the U.S. Geological Survey - Earthquake Hazards Program (Award G16AP00022) and the U.S. Department of Energy (Award DE-FE0006821). An additional proposal with the USGS is pending. Figure 4. (A) Map view and (B) 3D view of subsurface faults in the Wellington and Anson Bates fields in north-central Sumner County, Kansas. The colors correspond to the slip tendency of the faults in a strike-slip faulting regime.